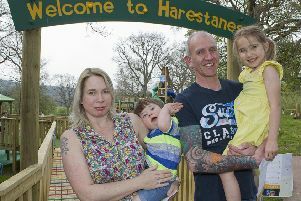 Jason Kane of Ballantyne Place, Peebles is in a dispute with the council over ownership of a parking bay. Concerns have been raised about Scottish Borders Council’s filing system following a dispute over a parking bay in Peebles. Jason Kane of Ballantyne Place says he was shocked to discover the council had “misplaced” a document relating to the ownership of a parking bay outside his home. The 48-year-old installed a parking pole in the space in January 2018, but has been forced to remove it after the local authority claimed it had adopted the road. Mr Kane told us: “I work in Edinburgh and when I come home I can’t get parked. I don’t want to go in somebody else’s bay so I put up a parking pole. “A neighbour complained and a week after that the council issued me with a notice to remove it. I was confused because I own the bay, it’s in my title deeds and documented on the land registry form. “The main piece of evidence is the road traffic consent form, so I requested a copy of that document from the planning department. “The first paper said all adoptable work was shown in colour on the technical drawing. Unfortunately, they were unable to find the original colour-coded document to show which areas had been agreed between the developers and the council. “They were only able to provide me with a black and white copy which is no use as it fails to show what areas have been adopted by the council from the building contractors. Mr Kane removed the pole last week, but is urging homeowners in a similar position to ensure that the council provides them with a colour copy of original road traffic consent form for their specific area. “This is not the first time I have heard that the council has failed to keep or lost records and it is extremely worrying,” he said. “I’m Peebles born and bred, I know there can be issues with parking so the fact that a bay was included with the property was one of the reasons I bought it. A spokesperson for Scottish Borders Council said: “The council is in no doubt that the parking space is part of an adopted road network and as such we asked Mr Kane to remove this obstruction following complaints about it.